For years the only options to replace missing teeth were bridges or dentures. Today your doctor also has the option of using dental implants. Dental implants are placed in your jaw to replace the roots of teeth. They are also used to support bridges, crown, or dentures. They are a permanent and more natural feeling alternative to bridges and dentures. At Westlake Hills Dentistry we believe everyone deserves a beautiful and healthy smile. Dr. Ho uses dental implants to achieve this goal. With the placement of implants your smile will be restored and repaired. They are permanent replacements for the roots of your teeth and offer you natural feeling and durable solutions for missing or damaged teeth. Implants offer you many benefits. Clean your mouth and tongue each day with a soft bristle brush before inserting your dentures to remove any debris and help stimulate circulation. Your speech is improved since you don’t have to worry about poor fitting slipping dentures. Implants are more comfortable then bridges or dentures. Your bite is improved because your teeth are stable and implants function just like your natural teeth letting you eat without pain or discomfort. Implants restore and boost your confidence since you will have a beautiful natural smile. No teeth are reduced with implants. This means you retain more of your natural healthy teeth and your oral health is improved. Implants are a long-term durable solution to missing teeth. With proper care they will last a lifetime. Since you don’t have to remove implants like you do dentures they are easy to care for. You care for them just like your natural teeth, and you don’t need to use messy adhesives since they are a permanent part of your jaw and not removed. The first step to dental implants is to discuss your treatment options with Dr. Ho and ask any questions you may have. If your tooth is chipped or damaged it must be removed first. Next a titanium post (the implant) is surgically placed into your jawbone. This surgery is done under general anesthesia. The implant post bonds and fuses with the jawbone. This healing process usually takes about 12 weeks. 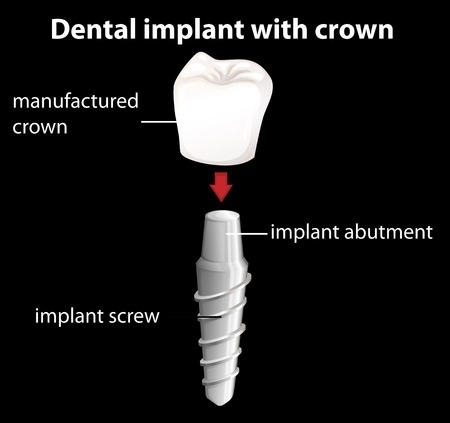 After this time the doctor will then place an abutment (small connector post) onto the implant post. Your new tooth will be securely attached to the abutment. Dr. Ho takes impressions of your surrounding teeth and bite, and then uses these impressions to mill your new tooth. Your new tooth will match the color of your natural teeth exactly and once attached to the abutment your new tooth will look and feel just like your natural teeth. You care for your new teeth just like your natural teeth. You can eat, drink, brush, and floss your new teeth and enjoy a beautiful smile. For more information about implants in Austin, Texas, contact Westlake Hills Dentistry today. Our offices are equipped to provide an array of restorative procedures such as porcelain veneers, dental implants, composite bonding, and tooth-colored fillings.